The minister of the Special Secretariat for Human Rights , Maria do Rosario, offered on the afternoon of Monday, 28/03, a whole security structure and parliamentary investigation into Mr Jean Wyllys (PSOL-RJ), who said he suffered threats Death of social networks. 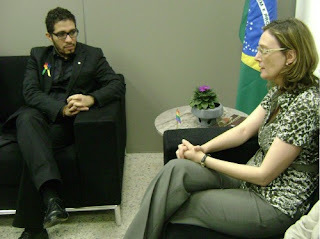 Maria del Rosario assured the Member that will take science to the Federal Police and make every effort to ensure the protection not only of Jean Wyllys, but all those who suffer from homophobia in Brazil. "This situation is very worrying. As Rep. Jean Wyllys, how many Brazilians are being threatened and even murdered today at the exits of subways, buses, streets in general? "Asked Maria do Rosário. Jean, who took the fight in the House of Representatives for the rights of minorities, has received increasing threats in the Twitter profiles of homophobic neo-Nazi, racist and reactionary wing religious fundamentalists. In February, his Facebook profile has been the target of an avalanche of false accusations, which eventually resulted in its temporary ban until the support team verify the precedence of the complaints. According to the deputy, "I have enormous respect for Catholics and evangelical Christians, but I will not tolerate crime virtual fundamentalist racist and homophobic. More than a homosexual is brutally murdered per day in this country because of speeches like these that sometimes threaten and offend me. We can not face the homophobic speech and incitement to violence as harmless, especially when it comes to religious leaders. These men who call themselves "God" should be more responsible (and humans!) In time to lead the minds of the faithful. "